Lumber has traditionally been moved either in box cars or on flat cars. Box cars have an advantage in that the loads are completely enclosed, but have a real disadvantage in that they are difficult to load and unload, as all lading has to pass through the doors in the side of the car. Flat cars are extremely easy to load and unload, but offer no protection to the loads. 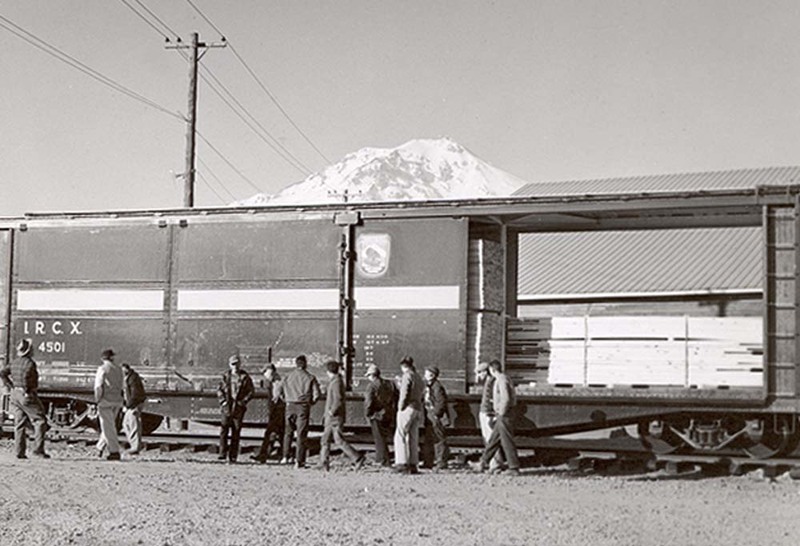 When the railroad’s two new cabooses (#101 and #102) arrived on the McCloud in 1962, they were delivered in person by a vice president of the manufacturer. The vice president went to lunch with Flake Willis, then president of the McCloud River Railroad. Over lunch Mr. Willis complained about the inadequacies of common boxcars for lumber loading purposes and sketched out on a napkin the basic plan for a new type of car that would offer the same load protection characteristics of a boxcar combined with the ease of loading/unloading characteristics of a flatcar. The result was the all-door boxcar. The all-door boxcar initially caught on, and many timber companies and railroads throughout the United States and Canada purchased such cars. However, the sliding panels added substantially to the maintenance needs (and expense) of the cars. 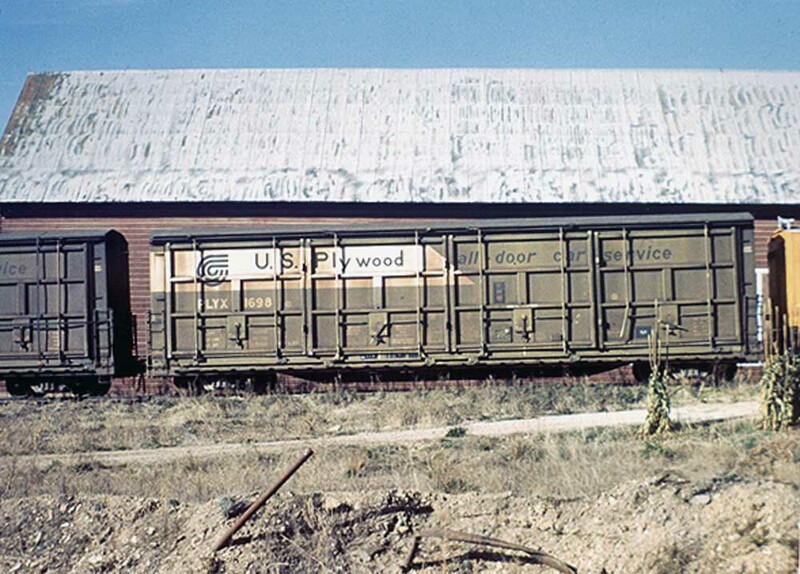 A general movement in the lumber industry to packaged lumber loads made the use of flatcars practical, and by the late 1970s most all-door boxcars were withdrawn from service. A few can still be seen operating today, but they are few and far between. International built the prototype car for Morrison Plan, Inc., their corporate parent, in the summer of 1962. 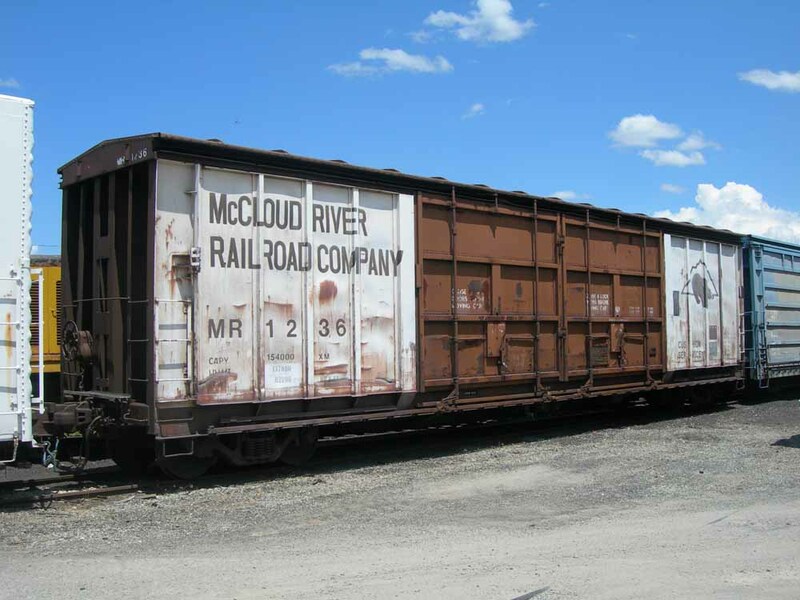 Morrison leased the car to the McCloud River Railroad for a period of five years, with rental fees set at $5 per day. U.S. Plywood purchased the car at the end of the lease, painted the car a flat green, and lettered it PLYX #1000. The car served U.S. Plywood for a few years; however, by the end of the 1970s the car sat derelict in the McCloud yard. U.S. Plywood sold the car to the McCloud River Railroad in 1977, which promptly converted the car to flat #1000. The prototype all-door car is being loaded with lumber in McCloud. Photo from the Travis Berryman collection. MR #1000, still in its original configuration as an all-door car, is visible behind the plow #1767 in this photo by Dennis Sullivan. McCloud, CA, 5/2003. MCR flat car #1000 after it has been cut down from the all-door boxcar. As the intial lease for the #4501 drew to a close, the McCloud River Railroad placed an order with Thrall for fifty all door boxcars. The order cost the company a million and a quarter dollars, with financing for the purchase provided by the Marine Midland Grace Trust Company of New York. However, before the cars could be delivered, U.S. Plywood assumed the order through their subsidiary Plycar Corporation. Plycar leased the cars back to U.S. Plywood through a lease signed on March 1, 1967. Plycar placed a second order for another set of fifty cars with Southern Iron Works sometime in the spring of 1967. Thrall built the first fifty cars in March 1967. U.S. Plywood numbered this first set of cars in the 1400- and 1600-series numbers, as follows: 1410, 1412, 1414, 1416, 1418, 1430, 1432, 1434, 1436, 1438, 1450, 1452, 1454, 1456, 1458, 1470, 1472, 1474, 1476, 1478, 1490, 1492, 1494, 1496, 1498, 1610, 1612, 1614, 1616, 1618, 1630, 1632, 1634, 1636, 1638, 1650, 1652, 1654, 1656, 1658, 1670, 1672, 1674, 1676, 1678, 1690, 1692, 1694, 1696, and 1698. Southern Iron Works built the next fifty cars in November and December of 1967, with U.S. Plywood numbering those cars into the 1000- and 1200- series as follows: 1010, 1012, 1014, 1016, 1018, 1030, 1032, 1034, 1036, 1038, 1050, 1052, 1054, 1056, 1058, 1070, 1072, 1074, 1076, 1078, 1090, 1092, 1094, 1096, 1098, 1210, 1212, 1214, 1216, 1218, 1230, 1232, 1234, 1236, 1238, 1250, 1252, 1254, 1256, 1258, 1270, 1272, 1274, 1276, 1278, 1290, 1292, 1294, 1296, and 1298. The cars suffered through some initial teething problems. ICC inspectors almost immediately red tagged all of the Thrall built cars for bad door stops, which Thrall corrected at one of their plants in Chicago. The cars also seemed to get into more than their share of wrecks in the first years, with sideswipes being the most common affliction. The U.S. Plywood were delivered in this olive and cream paint scheme. Photo from the Travis Berryman collection. PLYX car #1254 in front of the shop. Jeff Moore collection. Champion International re-painted at least one of the cars into this blue scheme after acquiring U.S. Plywood. However, most of the fleet kept the original colors until the end. Photo by and courtesy of George Landrock. 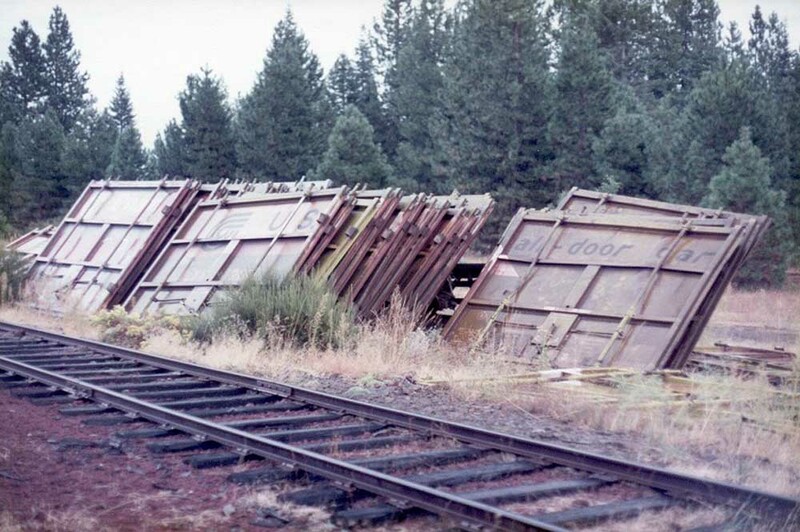 By the mid-1970s, the all door cars had fallen out of favor and spent most of their time stored in the McCloud yards. U.S. Plywood sold the remaining 94 cars to Itel at the same time that company also purchased the McCloud River Railroad. Itel immediately set out to rebuild the cars into standard boxcars, which would both provide the company with investment tax credits and make the resulting cars eligible for incentive per diem rates. 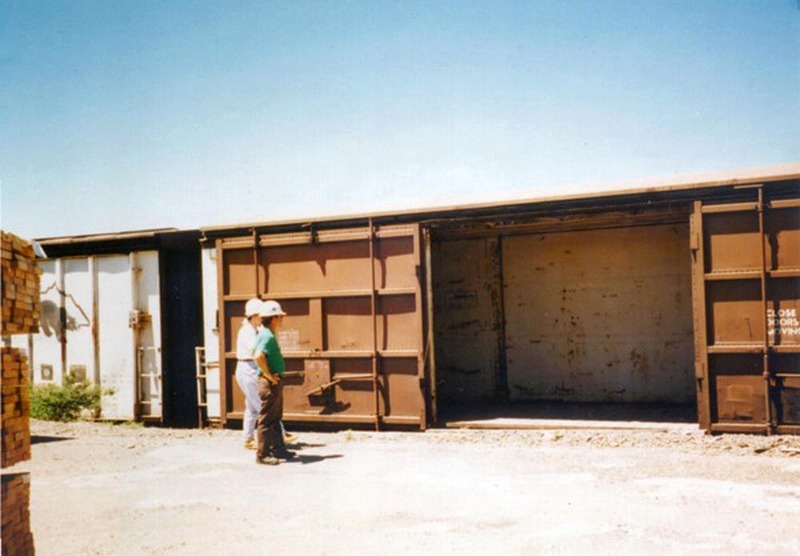 The work is said to have been done by FMC in Portland; if so, the doors removed from McCloud made their way back to McCloud, where they were stored until scrapped in the early 1980s. A few of the removed doors survive as part of a loading ramp at Ash Creek Junction. McCloud River Railroad did buy the #1452, which it converted to work flat #1001. The cars saw relatively little use on the railroad afterwards, with their primary chores being to haul bagged diatomaceous earth from the Dicalite reload and occassional lumber shipments from P&M Cedar after they reopened the McCloud mill. The McCloud Railway purchased the surviving cars shortly after acquiring the rest of the property. A few of the cars saw service in the first years of that company; however, by the late 1990s the shop was in the process of scrapping all of the cars, with the last one cut up by 2004/2005. The railroad converted many of the bodies into sheds, with most of them in McCloud at the shop and Ash Creek Junction and one at Bear Flat. The railroad retained on frame for use as a maintenance flat until the fall of 2011, when the frame disappeared from the property as was likely scrapped. One intact car- MR #1236- survives in the collection of the Western Pacific Railroad Museum in Portola, California. Doors removed from the ex-U.S. Plywood all-door boxcars converted to McCloud River boxcars are seen here piled in the equipment storage yard east of McCloud on 17 Sept 1982. Photo by Jimmy Bryant, courtesy Nevada Historical Society. Most of the doors removed from the US Plywood rebuilds during the re-build process were scrapped. However, the railroad used several to build an earthen loading ramp at Ash Creek Junction. Jeff Moore photograph. 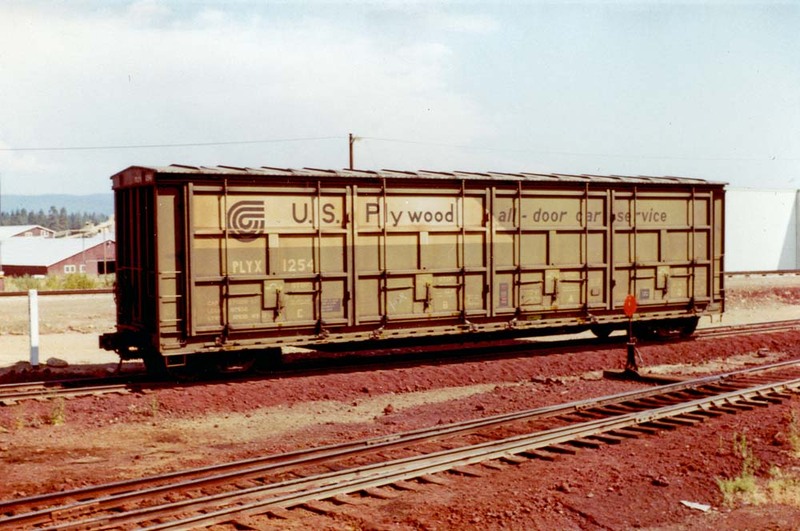 A broadside view of one of the ex-US Plywood all-door cars re-built into standard boxcars. Photo by and courtesy of Roger Titus. A McCloud Railway all-door car being loaded by P&M Cedar Products in McCloud. Lee A. Christopher photograph. Portola, CA, 7/2011. Former McCloud River Railroad #1236 at the Western Pacific Railroad Museum, Portola, CA. Bear Flat, CA, 6/2006. The body of MR #1690 in use as a section shed. McCloud, CA, 5/2003. Several of the former boxcar bodies are in use as sheds in the wareyard adjacent to the shop building in McCloud. The frame of one of the all-door cars- probably #1058- in service on the McCloud Railway as a maintenance flat.